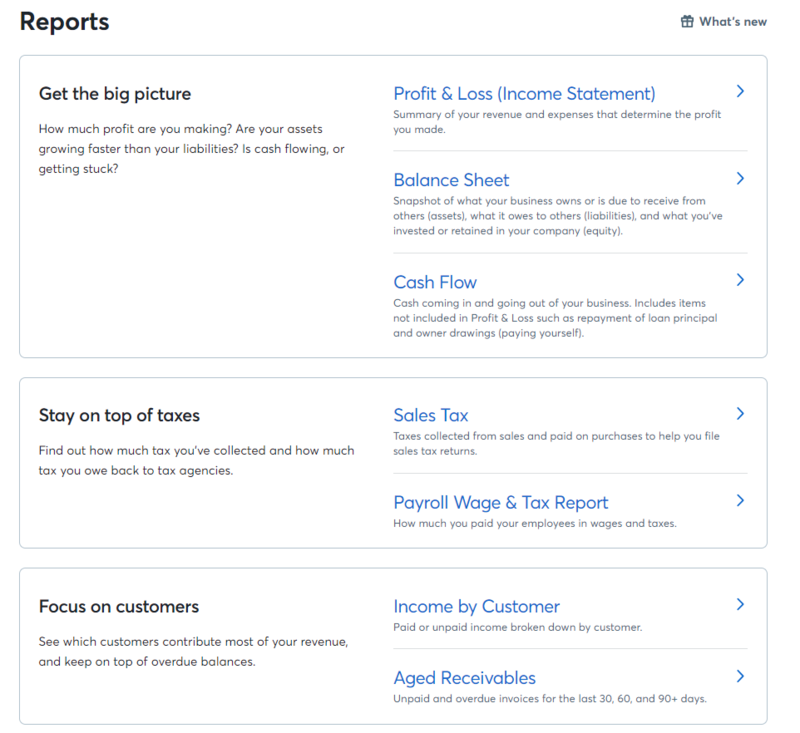 The Reports page is where you can dive deep into the numbers you see on the Dashboard, and where you can track how your business is doing month over month. The new Reports were built with better comprehensive analysis of your data, and ease of understanding in mind. If you are primarily using Wave as an invoicing and sales platform, there are a number of changes to the Reports page that are particularly significant for you. We’ll break these down here. The Reports page has been reorganized, for the better. Some reports have been consolidated, some renamed, and we’ve introduced a brand new Cash Flow Statement. When you create, send, and receive payment for Wave invoices, your reports will reflect these changes in various ways. To get the most out of this functionality, there are three reports that you’ll want to reference especially frequently for insight about your business’ income: the Profit & Loss Statement, the Cash Flow Statement, and the Aged Receivables Report. We’ll guide you through the changes we’ve made here and what this means when reviewing your business performance. What was previously known as the Income Statement is now referred to in Wave as the Profit & Loss report. 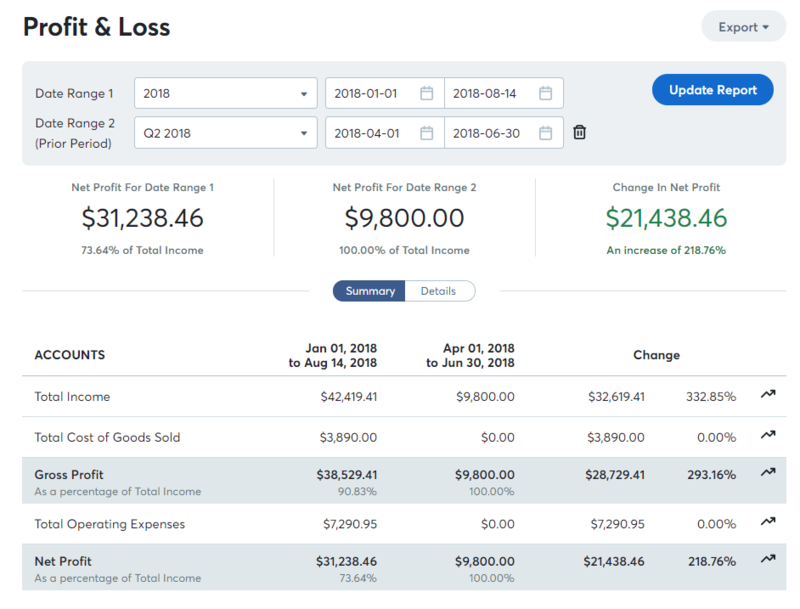 After generating a Profit & Loss report for a selected period, you’ll see your total income for that date range in two places: at the top of the page as part of the Net Income formula (Income - Cost of Goods Sold - Operating Expenses = Net Income), and just underneath as the first line item of the report. If you wish to see a breakdown of this information, scroll to the bottom of the page and click on Show Details. Each of the accounts to which you have recorded income will appear in alphabetical order with their totals for the period you selected when generating the report. But what if you wanted to compare two reporting periods to review how things are improving over time? We’re excited to let you know that this is now possible in Wave. We’ve introduced a comparative reporting feature. To use this feature, select Compare To… at the top of the report page, and select the date range that you’d like to compare the current period’s income against. The report will update to include the change in net profit over the course of this range, to include the income totals for each account, and finally the change that occurred between the selected periods as both a dollar and percentage amount. Your Profit & Loss Statement will measure your income on an accrual basis. This means that any invoices that you have created but that have not yet been paid will be included in the totals. If you’d like to see the actual cash that you’ve received in any period, then we’ve got you covered with the new Cash Flow Statement! Wave is an accrual accounting system. However, we understand that plenty of engaged entrepreneurs wish to also understand their business on a cash basis. To that end, we’ve created a new Cash Flow Statement, which works this way. The difference for this report is that your invoiced income will appear as financial transactions occur, rather than when you create invoices. Like the P&L, your Cash Flow Statement will offer you quick insights around your sales during a selected period. Your Cash Inflow (the money that you actually received in a period) will appear as part of the Net Cash Change formula at the top of the page (Cash Inflow - Cash Outflow = Net Cash Change), and your sales for the period will appear as the first line item in the report. You can see your cash inflow broken down by income account by clicking the Details option immediately underneath the Net Cash Change formula. If you have been associating your products and services with separate income accounts, then you’ll be able to see which of your products you have actually been paid for during a selected period. The Cash Flow Statement also offers Wave’s new comparative reporting feature. You can use this feature in the same way you would for a P&L. Comparative reporting will show you the cash sales totals for two periods, and the difference between both as a dollar and a percentage amount. Your Aged Receivables report will display information about invoices that have not yet been paid (dollar value and the number of invoices), which of your customers you can expect it to come from, and track which of your customers need an extra nudge to pay an old invoice. 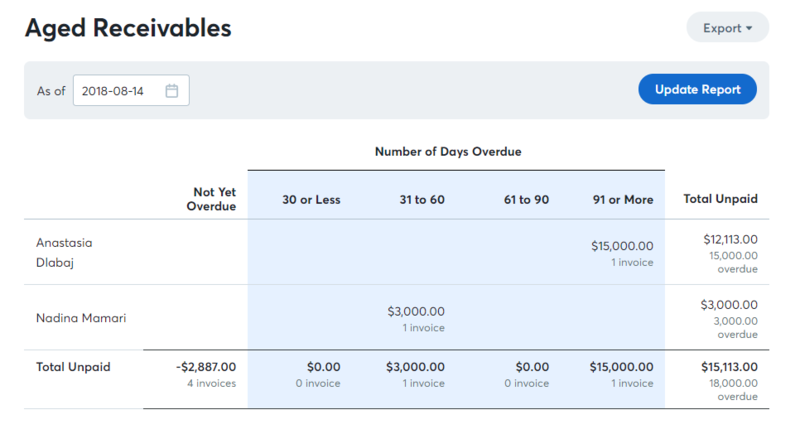 Aged Receivables has been updated to provide you with a greater level of clarity when tracking your coming due and overdue invoices. Your Aged Receivables is a key item to reference whenever you need to know how much income you can expect, or money you are owed, and where you need to follow up on unpaid invoices. Just like before the update, the Sales Tax Report contains a complete record of all of the sales taxes that have been applied to your invoices, but we've added one crucial feature: Sales tax reporting on a cash basis. If you're doing business in a region that conducts tax reporting on a cash basis (and it's worth checking with your local and federal tax authorities to see if that's the case where you are) you can now choose to generate a Sales Tax Report on either an accrual or cash basis. Just change the report type at the top of the page as needed. The detailed view of your Balance Sheet will contain the closing balance of your Accounts Receivable - the invoiced funds coming to you recorded as an asset - as a line item. Your Account Transactions Report will give you the ability to view all of the individual transactions assigned to any of your accounts. For the first time in Wave, these transactions can be filtered for on a cash or accrual basis. Your Trial Balance and Account Balances Reports will give you the balance of your income accounts and Accounts Receivable. In the case of the Trial Balance Report, these will be calculated based on the start of your fiscal year; in the case of the Account Balances Report you have the flexibility to see numbers outside the fiscal year restrictions. Wave also offers a Payroll Wage and Tax Report - something that isn’t relevant to your invoice income but may be of interest to you if you use other parts of the app. Our goal with these updates is to make it easier for you to make sense of what’s going on with your business. If you use Wave to send and receive payment for invoices, you should now have the tools to gather meaningful insights about your sales and grow your business.